Happy Friday everyone! Here's some amusement for you to take with you into the long weekend. Funny part of this: I didn't know Patrick L. Norton actually had a fake LAST name, too! God, what a drama mcqueen. 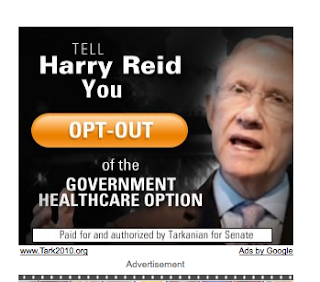 I mean, if people told Harry Reid this, his best response might be: "Oh, don't worry about it. I already killed that all by myself. We're good." 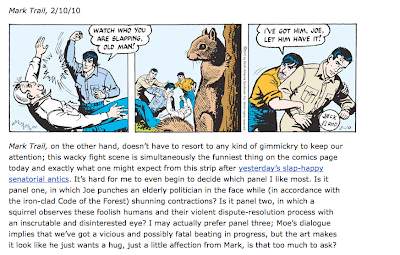 And here's the shocker: Garfield cartoonist Jim Davis LOVES it. Not only did he not sue, he sent over his compliments. Wow, huh? Don't forget to join us at LVRocks.Com from 4-6 pm PT on Saturday for an hour of The Petcast followed by an hour of The Strip. See here for details. We're live on Saturday from 4-6 pm PT at LVRocks.Com to record The Strip and The Petcast. You can listen along -- hear all the flubs! -- and chat with fellow listeners in the chat room. Plus, see us via the studio cam! We have a Vegasy Petcast coming, too. Wynn Las Vegas oddsmaker Johnny Avello joins Emily and me in the first half-hour to discuss -- and likely debate with Emily -- the prop bet odds he has created for the upcoming Westminster Dog Show. Then we are joined by Canadian woman whose cat came back to her after 14 years. As for The Strip, we'll be playing the Franco Dragone interview that sparked this column. Dragone, creator of Mystere, O, A New Day and Le Reve, talks about the $280 million show he's creating for Macau, why he got into bed with Dreamworks for a live Kung Fu Panda show, what he thinks about Le Reve now and much more. Join us, won't you, 4-5 p.m. PT for The Petcast and then 5-6 p.m. for The Strip? That thick, thick Belgian accent was so overwhelming that I passed the audio around to three friends to make sure I had heard Franco Dragone correctly. Dragone, you ought to know, created Mystère, O, Celine Dion’s … A New Day and Le Rêve. The first two represented the most significant reinvention in Las Vegas entertainment since Siegfried & Roy and are now among the top ticket-selling live productions in world history. Back when Dragone made those shows, he was the guiding creative force of Cirque du Soleil. He was responsible for six of their shows, including Nouvelle Experience, the one that enchanted Steve Wynn at the Santa Monica Pier in 1990 and then wowed Vegas-goers in the Mirage parking lot in 1991. That’s how the empire was launched. But O was also Dragone’s final Cirque contribution, along with La Nouba at Disney World, which also opened in late 1998. After O, Cirque founder and owner Guy Laliberte brought in TV executive Daniel Lamarre as chief operating officer, with the aim of accelerating Cirque’s production schedule and expanding the brand. Dragone, fearful of losing creative control and uncomfortable with this direction, departed. When I got Dragone on the line to discuss the exponential growth of Cirque, he was quite clear right at the start that he would not criticize his “former family.” Like a divorcee trying to keep it civil for the sake of the kids—Dragone still consults on the shows he created for Cirque—he warned me not to go there. Voila, of course, is French for “there it is.” And there it is indeed, the path not taken for Cirque du Soleil. 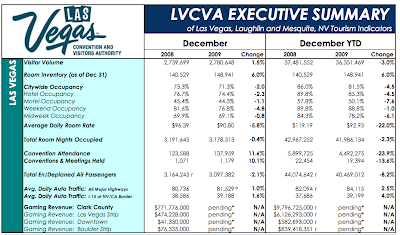 The LVCVA just issued the monthly data for December, closing the books on 2009 with the asterisk-al note that they don't have the gaming totals yet. But the visitation figures are all in for the month and year, and if you're a data geek you can download the summaries as well as those dating all the way back to 2002. Unfortunately, even what looks like good news isn't so good. December was the fourth consecutive month of increased visitation over the same month in the prior year, but it also was a weaker increase -- 1.5 percent -- versus 4.3 percent in September, 3.7 percent in October and 2.7 percent in November. Also, the total number of room nights occupied actually fell 0.4 percent in December versus December 2008 after three straight months of increases. Conclusion: The opening of CityCenter in December did little, if anything, to boost visitation. That may explain free-falling room rates at ARIA, too. Ut-oh. The January figures will tell the tale because if all that publicity and fanfare can't pique even short-term interest, MGM Mirage is in a massive vat of stinky trouble. Meanwhile, the 2009 figures show Vegas saw 3 percent fewer visitors, finishing up at 36.5 million. That the lowest since 2003, when the city greeted 35.5 million. The big difference, however, is that today's Vegas has 148,941 hotel rooms, about 8,000 of which were added in 2009, whereas back in 2003 the city offered 130,482 rooms. So the 2003 figure represented an occupancy rate of 85 percent and the 2009 figures mean occupancy was at 81.5 percent. The average room rate on 2003 was $82.48; last year, it was $92.93. The Las Vegas Convention and Visitors Authority tried to put a happy spin on all this by noting that the 81.5 percent occupancy was "the highest of any major destination in the U.S." and 26.4 percentage points above the overall U.S. average. Which is like Florida getting excited that they grew more oranges than North Dakota this year. I won't even get into the convention data. Much too depressing. Look at it for yourself if you like, preferably somewhere far away from a sharp knife. Ouch. Still waiting for CBS reaction and will update my story when I do. How odd that (a) Mandy Stadtmiller provided the first name of America's first legal manwhore while I provided the entire name and more biographical detail a week sooner but (b) Henry Brean apparently feels the New York Post is in general a more credible or worthy source than me. Mike Weatherford pulled this crap, too, last month, when he interviewed Bette Midler and asked her about possibly moving to the Wynn while pretending that my discussion with Steve Wynn about Bette in which the seed of this very idea was planted had never happened. The only way I'll be getting any credit for this NFL thing is if Norm Clarke covers it again tomorrow. The rest of these folks are too insecure to acknowledge that they're not the only ones who matter in this media cesspool. By contrast, take a listen to my interview with Cirque CEO Daniel Lamarre or read my Cirque cover story, both of which include mentions of competing journalists and their Cirque-related scoops. That's just good journalism and it boosts credibility. I could not recall what film this formation was from. Turns out, many, but the one on my mind was The Right Stuff, of course. Hope y'all enjoyed the Super Bowl. Look what I did while I was using my betting slips as toilet tissue. (Ouch, actually.) Anyhow, Click on the date below to make it play or right-click to save it and listen at your leisure. You can subscribe, too, (it's free!) in iTunes or in Zune. The head-scratching and bellyaching began way, way back in 2003 with Zumanity. Then came Ka, Love and Criss Angel Believe. But despite naysayers who think Cirque du Soleil is overextended in Las Vegas, here comes show No. 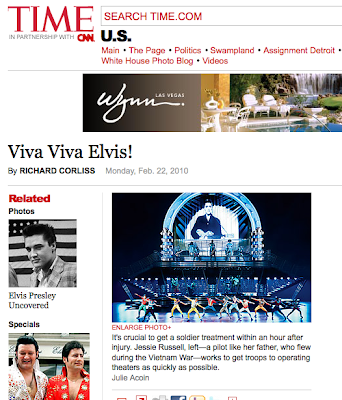 7, Viva Elvis at Aria, officially opening on Feb. 19. What’s the deal? Steve sat down in Montreal last month with Cirque CEO Daniel Lamarre, who says he wouldn’t mind having 50 shows on the Strip, if only they had the time and available showrooms. But the company is busy elsewhere these days, planning permanent productions at Radio City Music Hall and the Kodak Theatre, not to mention trying to fix the disastrous Criss Angel show at the Luxor. In Banter: An incredibly sexist remark from an oddsmaker, Aria room rates falling some more, Super Bowl weekend is up, Obama steps in Vegas poop again and Bill Clinton is a headliner. Did Kia End-Run #NFL With #Vegas Ad? In all instances the ads should be for tourism destinations only. So TV/radio/internet/print ads for Las Vegas tourism or Vegas.com will be allowed. Ads for specific hotels or resorts are NOT permitted if they house any type of gambling. 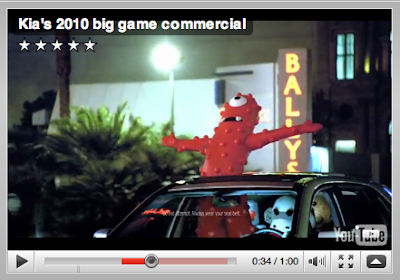 Ads may NOT contain any gambling references - audio or video - or any gambling imagery. So by way of example, an ad for Las Vegas tourism with pictures of slot machines, dice, cards, or a wide shot of Vegas strip and casinos would NOT be ok. However an ad for Las Vegas tourism with pictures of golf, swimming pools, and performers WOULD be ok. The content of the ads (audio and/or visual) must be “family friendly”. Any suggestive ads or those showing or suggesting inappropriate activity (e.g., alcoholic excess, sexual adventures), or those that imply general misbehavior (e.g., “What happened in Vegas Stays in Vegas”) will not be approved. So, then, how did THIS happen? Granted, this was a car ad, not a tourism ad. But it made Monte Carlo look pretty darn cool, which is a bit of a triumph, and MGM Mirage had to have signed off on that. 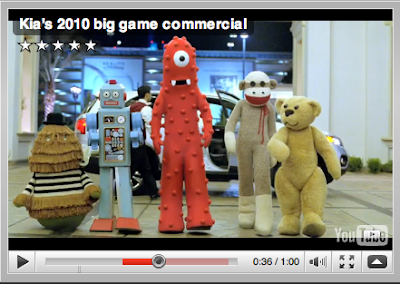 So did a Vegas casino SNEAK an ad on to the Super Bowl broadcast via Kia? Is this some brilliant end run? Fascinating. I will get to the bottom of this. 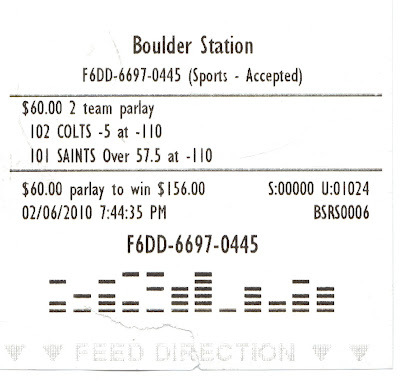 It's SUPER BOWL SUNDAY, as documented by moi for AOLNews.Com with a behind-the-scenes look at the oddsmakers! And if you don't care about that, listen the incredibly fun chat with Animal Planet's Puppy Bowl VI referee Andrew Schechter in a special edition of The Petcast by clicking here or right-click here to save it for later. In other words, I'm expecting a Colts blowout. That is, I bet there would be no overtime for which I can win a whopping 1.1 percent premium and that there'll be no 2-point conversions, for which I will get a 20 percent premium. I didn't realize the lousy payouts when I bet them; I just thought it would be fun to bet one or two of these and these seemed like ridiculously safe choices. Hence, the lousy payout, alas. And, yes, contrary to my answer to Miles on the show on Saturday, I did end up laying some money for a pal in New York. When we recorded the show, I didn't know he'd want to, but I probably should have. My friend and I actually picked somewhat opposite bets. 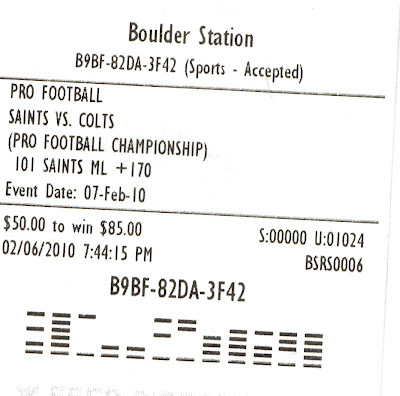 He agrees with the over -- he put $50 on that -- and he put $50 on New Orleans to cover the 5-point spread. 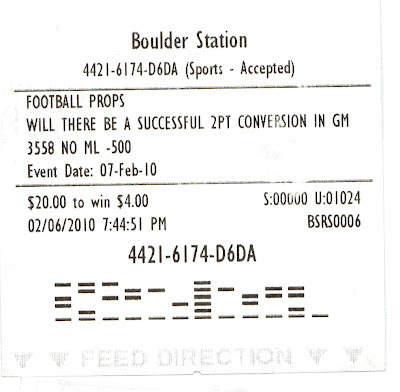 Here are his tickets, for those of you who think I would just take his money and not actually lay the bet. Horrors! 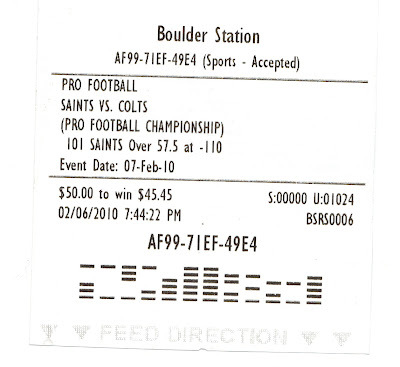 Not sure why the first ticket, betting on the "over," seems to say "SAINTS OVER 57.5" because it's not a parlay bet, it's just a bet on the overall game. And I checked; I bet it right. Must be something with how these things are written. Saddest thing: I want the Saints to win. 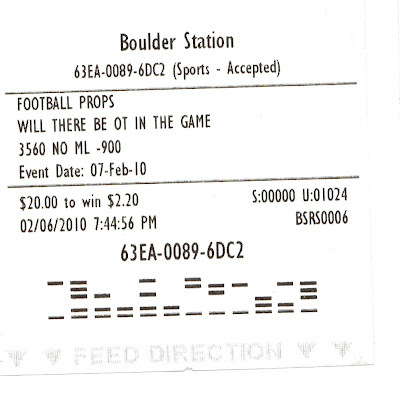 Or I did before I made my bets. Now I need to decide where to watch the game. Likely: My house with my dogs. Loser.